When we talk to our customers, they tell us that it's harder than ever to build a compelling customer engagement strategy. You have to consider all the customer touch points, from selling and marketing, to when customers are using your product or when they need support. At every step of the way, integrating the right communication at the right moment makes customers informed, happy, and successful. That's why at Twilio, we've been investing for 11 years to build the customer engagement platform that developers and companies can use to build world class experiences. We started by building the industry leading APIs for voice and SMS, and have since added video, Facebook Messenger, and WhatsApp as means for companies to communicate with their customers. SendGrid has been doing the same thing, but they started by building the industry's leading developer platform for email. If you’ve been at a hackathon, conference or meetup in the past 10 years you may have seen someone in a red Twilio track jacket and someone in a blue SendGrid hoodie serving developers side-by-side. We’re excited about the opportunity to continue that journey of serving the developers in our community, as one unified platform. By adding the leading developer platform for email, we're proud to now offer the full breadth of channels that companies use daily to engage with their customers. But our journey together is just starting. We'll be innovating in the months and years to come, making it ever easier to use all these channels together in a cohesive customer engagement strategy - with APIs that make building omni-channel experiences a breeze. Our goal is to be the single, trusted platform for all of your customer communications. 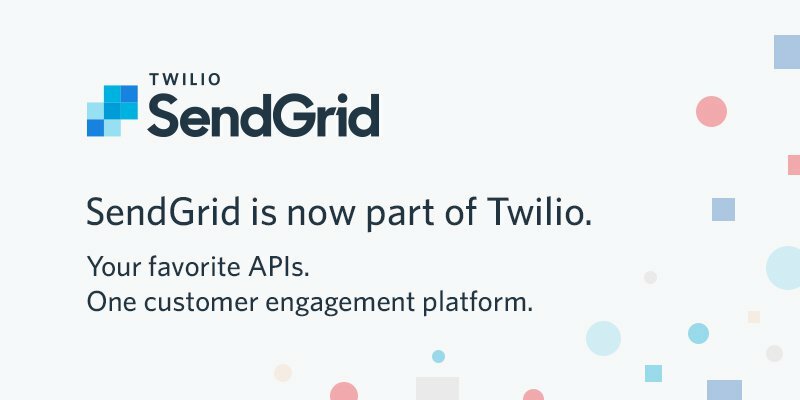 This is Day 1 of the next chapter of Twilio and SendGrid. We can't wait to see what you'll build. Want to learn more? Join us for a joint webinar on February 13th.